How safe are you from an emotional take over? You feel your temperature rising, body tightening, fists clenching, energy building and no release valve. So you scream, hit, shut down, retreat or attack. 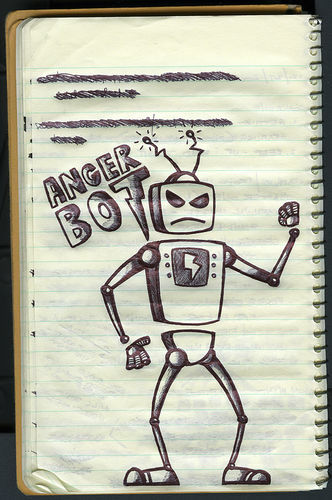 Anger, here represented by Anger Bot, has taken you over. Get out of your mind and tune in to your senses. Ask yourself: “Where am I feeling this in my body.” Maybe you clench your teeth, make a fist, or feel tightness in your chest or stomach. Are you breathing? Think about anger as a force that has taken you over and is getting you to behave certain ways. 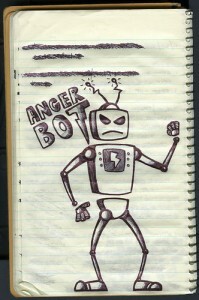 Who is in charge—you or Anger Bot? In therapy you and your therapist can collaborate to help you become conscious of what triggers anger so that you can chose how to respond. You can change your behavior through the consistent practice of separating thoughts and feelings. Mindfulness practices enhance your ability to let go of thoughts and notice, experience, and stay with feelings. When anger is in charge of you, you have given up choice. As you become conscious and recognize danger, that is anger with a d in front, d–anger, you can prepare. Anger preparedness moves you in to a position of choice so that you can act in a way that will feel better to you and those around you. Anger Bot no longer rules! https://www.ginnywinn.com/wp-content/uploads/anger-bot.jpg 500 332 Ginny Winn http://www.ginnywinn.com/wp-content/uploads/ginny-winn-mft-logo-120.png Ginny Winn2012-12-12 02:13:252014-05-25 02:22:59How safe are you from an emotional take over?